Anxiety is probably a common cause of difficulties settling to sleep at both the start of the night and overnight. Find out about strategies you can use to help your child. 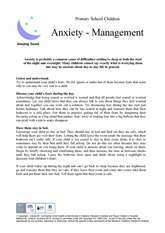 Anxiety is probably a common cause of difficulties settling to sleep at both the start of the night and overnight. Many children cannot say exactly what is worrying them but may be anxious about day-to-day life in general. Try to understand your child's fears. Do not ignore or make fun of them because fears that seem silly to you may be very real to a child. Acknowledge that being scared or worried is normal and that all people feel scared or worried sometimes. Let your child know that they can always talk to you about things they feel worried about and together you can work out a solution. Try discussing fear during the day (not just before bedtime). Talk about how they can be less scared at night and reassure them that their bedroom is a safe place. Get them to practice getting rid of their fears by imagining their favourite colour as a big cloud that pushes 'fear' away or making fear into a big balloon that they can prick with a pin to make disappear. Let your child know that they can always talk to you about things they feel worried about and together you can work out a solution. Encourage your child to stay in bed. They should stay in bed and find out they are safe, which will help them get over their fears. Letting your child leave the room sends the message that their bedroom isn't really safe. If your child is too scared to stay in their room alone, it is OK to sometimes stay by their bed until they fall asleep. Do not do this too often because they may come to depend on you being there. If your child is anxious about you leaving, check on them. Begin by briefly checking and comforting them, and then increase the time in between checks until they fall asleep. Leave the bedroom door open and think about using a nightlight to decrease your children’s fears. If your child wakes up during the night and can't go back to sleep because they are frightened, go and reassure them that they are safe. If they leave their room and come into yours, take them back and put them back into bed. Tell them again that their room is safe. It is important to comfort children who are scared. When your child holds onto you as they are being tucked in, or calls out in fear, you should go back to their bed and find out what is wrong. Say something like, “You are safe; we are here to make sure you stay safe.” Be sure to tell them that they are safe. Help your child become attached to a security object like a toy or blanket. They can keep this in bed with them to help them feel more relaxed during the night. Avoid scary TV shows, including the news or videos, or stories that may add to your child's fears. Avoid talking about their worries just before bedtime. Teaching your child to relax can help them to fall asleep at bedtime. Below are some ideas of how to do this. Giving them something else to think about while lying in bed can help to distract them from their fearful thoughts. Remember, it is impossible to be relaxed and scared at the same time! A reward chart for trying to be brave can be helpful: at first this may be for not getting out of bed, and just calling out if they really feel they need you, and then later, as your child feels safer, to reward them for staying in bed all night and not calling out. Reward and praise your child as soon as they wake up in the morning 'for knowing that their bedroom is a safe place to be' and remind them they can always talk to you when they feel worried. The reward should be something small and could involve collecting a certain number of stickers leading to a reward the child will enjoy (such as a lucky dip prize, trip to the park). This will vary depending on the age of your child. The reward should be easy to achieve for the child to begin with to increase the chance of your child being able to succeed. Starship Foundation and the Paediatric Society of New Zealand thank the Centre for Community Child Health at the Murdoch Childrens Research Institute and Royal Children's Hospital, Melbourne, Australia, for making this content available to parents and families. © Copyright – Centre for Community Child Health at the Murdoch Childrens Research Institute and Royal Children's Hospital, Melbourne, Victoria, Australia 2014. Except as permitted under the Copyright Act 1968 (Cth), no part of this content may be reproduced by a process, electronic or otherwise, without the specific written permission of the Murdoch Childrens Research Institute. This page last reviewed 06 July 2017.